Australia, under the captaincy of Ricky Ponting, defended their World Cup title with ease in 2003 – the first time the tournament was held in Africa. In 1999, they made it to the final by the skin of their teeth before comprehensively winning the trophy. But in 2003, they maintained a clean sheet by winning all eleven games, culminating in a 125-run win over India in the summit clash. Among Australia’s opponents in Group A were Namibia, who were playing in the World Cup for the first time. The two teams met on February 27, 2003 at the North West Cricket Stadium in Potchefstroom, in front of a decent turn-out of about 6000 people. This game was the fifth in the tournament for both the teams. Namibia, predictably, were soundly beaten in all their four games thus far in spite of a creditable showing against England. By contrast, Australia were dominant against all the sides they faced. Everyone expected a one-sided affair, and not surprisingly, it proved to be so. Ponting called correctly and opted to bat first. Medium pacer Burton van Rooi bowled with good control and was rewarded with the prized wicket of Adam Gilchrist in his third over. But Matthew Hayden was in a belligerent mood, and treated the inexperienced Namibian attack with disdain. He scored 88 off 73 balls before Louis Burger bowled him to peg the Australians back a little. Andrew Symonds and Damien Martyn got together at 146/4 and added 84 for the fifth wicket. Namibia did well to keep the score to 231/6 with seven overs left, but Darren Lehmann cracked an unbeaten 50 from 31 balls – including 28 in the final over – to propel the final total to 301/6 in 50 overs. Louis Burger impressed with his medium pace, taking 3/39 in ten overs. Against Australia’s world-class bowlers, Namibia had little chance to survive their entire quota of overs or to get anywhere close to Australia’s huge total. The great pace bowler Glenn McGrath was in his element, and the Namibian batsmen had no clue on how to tackle his accurate bowling. Jan-Berrie Burger, who made an attacking 85 off 86 balls against England, clouted McGrath for four off the third ball of the first over, but ‘Pigeon’ got his man a ball later, inducing Burger to edge one to Ponting in the slips. McGrath was surprisingly wayward in this opening over and ended up conceding twelve runs, including six wides. Stephan Swanepoel was the second wicket to fall, when Ponting snapped up another catch, off Brett Lee in the fourth over. After four overs, Namibia were 14/2 and were up against it already. McGrath soon proceeded to make a mockery of the chase by producing a lethal spell. In his third over (the innings’ fifth), he dismissed Morne Karg, caught behind by Gilchrist. From thereon, McGrath took at least one wicket in each of his remaining overs as the hapless Namibian batsmen fell like a pack of cards. In his fourth over, McGrath trapped Gavin Murgatroyd plumb in front. After seven overs, Namibia were 17/4. McGrath’s figures at this stage read 4-2-14-3. In his fifth over, he accounted for Danie Keulder as his fourth victim, caught behind. Half the side were back in the hut with just 28 runs on the board, and a massive defeat loomed large. Worse was to follow for the beleaguered Namibians as McGrath kept up the pressure. In his sixth over, he completed his five-wicket haul when Gilchrist caught Louis Burger behind. Namibia managed to get past the lowest ODI total – 36 by Canada against Sri Lanka earlier in the same tournament – as they limped to 45/6 in 12 overs. In his seventh over, McGrath achieved a double-wicket maiden as he removed captain Deon Kotze (caught behind) and his brother Bjorn (bowled) in the space of four balls. Andy Bichel got a double-wicket maiden of his own as he cleaned up the last two wickets in the next over. Namibia’s last four wickets failed to score even a single run as the African side were shot out for 45 in just 14 overs. Captain Kotze (10) was the only one to reach double figures. Man of the Match McGrath’s final figures read a spectacular 7-4-15-7, and that too after going for 12 runs in his first over. This performance broke the record of the best bowling analysis in a World Cup match, which previously was 7/51 by West Indian fast bowler Winston Davis against Australia at Headingley in 1983. The only other man to take seven wickets in a World Cup match is Bichel, who took 7/20 in Australia’s next game, against England at Port Elizabeth. McGrath’s return is the best ever by an Australian and currently the third best in ODIs, behind Chaminda Vaas’ 8/19 for Sri Lanka against Zimbabwe at Colombo in 2001-02 and Shahid Afridi’s 7/12 for Pakistan against the West Indies at Providence in 2013. Namibia’s total of 45 is the joint second-lowest in World Cup history – Canada also made 45 against England at Old Trafford in 1979. The record for the lowest World Cup total is also held by Canada, who managed only 36 against Sri Lanka at Paarl in 2003 as aforesaid. At that time, Australia’s victory margin of 256 runs was an ODI record. Since then, there have been four more instances of a higher victory margin. Currently, this margin is the second highest in a World Cup game, following India’s 257-run win over Bermuda at Port-of-Spain in 2007. Namibia’s entire innings lasted just 84 balls, which is the ODI record for the shortest completed innings in terms of balls. Gilchrist’s six catches in the match is also a World Cup record for the most dismissals by a wicketkeeper. 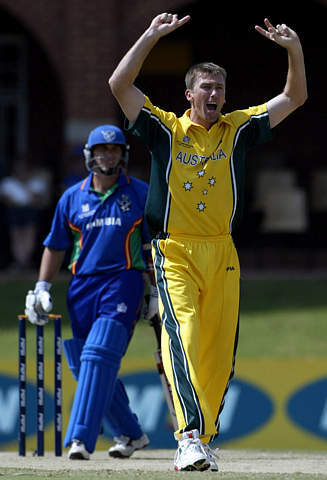 McGrath collected 21 wickets in all at the 2003 World Cup, at an average of 14.76, the third-best tally behind Vaas (23) and Lee (22). He bettered this effort in the 2007 edition, where he took 26 wickets in 11 matches at 13.73 – a record for the most number of wickets in a single World Cup tournament – as Australia completed a hat-trick of titles. Thanks to these achievements, McGrath also holds the record of the most wickets in World Cup history – 71 in 39 matches at 18.19, with two five-wicket hauls.